One Will receive a day’s benefit. It will be equivalent to losing one hundred days’ benefits. One get no benefit through all his life. Life Will become an empty dream. Ling Bao (灵宝) translates as “Spiritual Treasure.” The Ling Bao Bi Fa outlines the San Xian Gong, “Three Immortals Cultivation,” for completing the Ling Bao and thus becoming a Zhen Ren (真人) or Real Human Being. San Xian Gong consists of thee stages: Ren Xian Gong (人仙功) Human Immortal Cultivation, Di Xian Gong (地仙功) Earthly Immortal Cultivation, and Tian Xian Gong (天仙功) Heavenly Immortal Cultivation. The Taiji ball or “qiu” is an integral part of intermediate and advanced training in Yang Taijiquan. While there was some interest in the ball among Taiji practitioners in the 1920’x and 1930’s, interest subsequently diminished and few people, even in China today, are familiar with its extensive practice methods. In English there have only been several short written accounts by Lee Ying Arng and Yang Jwing-Ming, in particular, that described certain aspects of this training. Ball practice, however, is still taught to Yang family members and some close “indoor” students. The purpose of this article is to shed some light upon the purposes and methods of the taiji ball to the many students of Yang style Taijiquan that practice around the world. The goals of ball practice are to develop one’s root and refine one’s qi and internal strength. It is usually not taught in the family until the student has practiced for a minimum of four to five years and is somewhat familiar with the forms of Yang Taijiquan and the basic principles of push hands. If one has not attained a certain level of practice, it is counter-productive to learn the ball, as the student will rely more upon muscular effort than upon utilizing the unified strength of the whole body. Yang style ball practice probably has its origins in the Chen style, although the ball was also utilized in Wudang and Omei training for many hundreds of years. Yang style Taijiquan, while it evolved from the Chen style, in practice focuses more upon internalization of force and rarely emits it externally, except in fighting. To my understanding, among the major styles of Taijiquan, only the Yang and Chen styles have developed extensive practice methods utilizing the ball. The Yang style Taiji form is designed to develop physical conditioning, like most internal systems, by increasing the circulation of blood and qi as an integral method of self-healing, spiritual cultivation and fighting. The ball practice greatly helps to achieve this. Like the open hand set, one essentially develops “passive” internal strength, but one finds that when using it “actively” for fali, or explosive force, it greatly improves one’s power in push hands and fighting. As beginners do not usually possess the ability to eliminate tension in low postures, their energy and their blood circulation become blocked in lower stances and their root remains weak. The more relaxed one is within the stance, the deeper one’s root. One then can move easily to handling the heaviness of the ball because one’s strength emanates from qi, not from muscular tension, with practice. Over the years, one can start to utilize heavier and heavier balls, progressing, for example, from 8 pounds to 18 pounds. My grandfather used to say that if one changes the weight of the ball four times in one’s life and can handle the ball easily, one is sure to develop good gongfu. This is obviously not a short-term process. One must also learn, as in the practice of weapons, to allow one’s body and intention to “follow” the ball, not “lead” it. If one attempts to “lead” the ball, one has the tendency to use muscular force, so that the body “fights itself.” If one “follows” the ball, the qi and blood circulation in the absence of muscular tension can open and become more free-flowing. There is an old saying that if one’s qi and blood circulate well, one’s life can be long. In more advanced drills, the Taiji ball also contains a lot of coiling movements, which are used to improve Taiji ball push hands and fighting skills. 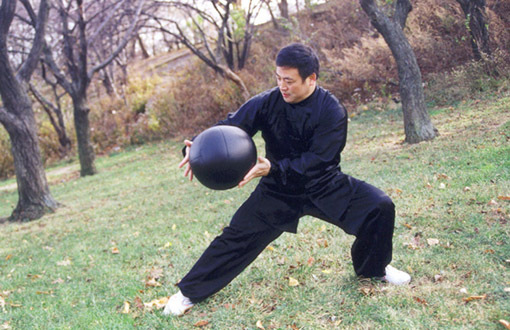 The Taiji ball exercises were developed for these purposes by the first and second generation of our family; Yang Banhou, for example, was particularly adept with the ball. As one’s root and coiling ability improve, one can emit explosive fali, or spring power, even in low stances. At higher levels of practice, one does not focus on qi, but rather upon the cultivation of spirit, or shen. Little physical strength is utilized at this level and the movements appear to be executed almost effortlessly. At the intermediate and beginner levels, however, it is more important to learn how to develop spring power rather than brute strength. This is done by developing one’s qi and blood circulation. Therefore, the goals of ball practice are to lower the root, increase coiling ability and to develop spring power. This will in turn improve one’s gongfu. “Gong” may be translated as ability and it must start with basic exercise training. In ball practice, one first begins with a heavy cube-shaped weight placed on a table, making the body to move it is multiple directions and in circles. The weighted cube is utilized first because it moves in a flat plane only. The ball comes later, as it allows movement in multiple planes at the same time, including up and down in the vertical plane and in multiple planes simultaneously. Balls can be made of iron, wood or leather filled with sand, and must be perfectly round. The diameter of the ball depends upon the size of the practitioner and the type of practice in which he is engaged. The standard ball, however, has approximately a two foot diameter. In the United States, a medicine ball is a reasonable substitute. On the table, the wooden or iron ball is more commonly used and there are four basic table exercises with many variations. In these exercises, the ball is moved in multiple planes, and one can use a round or square platform on the table to further refine exact spirals or distances using both one-handed and two-handed methods. Here predominantly spiralic or coiling exercises are practiced. The next level of training focuses upon the practice of the hanging ball, which may also be made of wood or iron, but is usually made of leather and filled with sand. It is suspended from above by a singular line. Again, spiralic movements are practiced, as well as fali and spinning movements. The hardness within the softness of the ball allows one to better emit fali, or explosive force, and to receive force while neutralizing or changing the direction of the ball’s path. Multiple balls may be hung together to allow one to practice these methods in multiple direction, simulating attacks by multiple opponents or multiple forces directed as you by one opponent simultaneously. At home, however, we never utilized more than two hanging balls at once. There are 18 exercises in this practice. Later, one goes on to two or even three person practice with hanging balls in which one person throws or thrusts the ball at another practicing fali, who must receive the force and change its direction or spiralic revolution (practicing fa-jin). Fa-jin here entails a change of direction or transmutation of force from one qualitative state to another. For example, a straight force can be changed into a circular force. In some exercises, one sends the ball back to the first person or to a third person who is in another direction, further refining and quickening one’s reaction. There are 28 exercises in this particular aspect of ball practice, although one can improvise numerous variations. The student will also learn a variety of basic exercises in which the ball is held in one or two hands. These postures are practiced in lower stances than one will actually practice the standard Yang style open-hand set, in order to deepen one’s root, develop one’s coiling power and fali, to improve martial skills. Many of the exercises are similar to actual postures in the open-hand form, such as “Lan Chao Wei” or “Grasp the Sparrow’s Tail” and “Ye Ma Fun Zhong” or “Parting the Horse’s Mane.” Other postures are quite different from the open-hand form. It is essential that, like the open-hand form, the movements be executed without muscular tension, have smooth transitions, show internal strength, clear intention, coiling ability, and utilize the whole body in unison, not just the arms. Although each of the individual exercises should be repetitively practiced on both the left and right sides, they can also be linked into a set. The number of different exercises practiced while holding the ball is 28. Therefore, the set contains 28 exercises. In addition, when performing he combination set, there are slight variations in some of the movements, to allow them to better flow into the next exercise. While the practice of Taiji ball can be grueling, depending on the weight of the ball, this set allows one to build endurance, allowing one to practice a variety of movements. Examples of these exercises are shown in the photos. The final component of Yang style Taiji ball practice applies push hands methods. The stances are also particularly low to cultivate ones root, and the methods may be divided into two types: two persons pushing the ball itself and two persons utilizing pushing of the ball to push the opponent. Peng, Lu, Ji, An, as well as other aspects of push hands practice, include “banshi,” or “adhering jin,” in which the ball is cupped and held with one hand. There are also 28 exercises in this aspect of ball training. The Taiji ball is a very good ancillary practice for Taijiquan about which little today is known or understood. It is the author’s wish that this article will help spread awareness among Yang style practitioners of this useful method, as well as its goals and precautions. Soaring Crane Qi Gong, also referred to as China Soaring Crane Qi Gong, or Crane Style Qi Gong, was developed in more recent years by qi gong master Zhao Jing Xiang, drawing upon information from other qi gong masters, ancient Taoist practices, and the movements of the crane, known for its peaceful and long life. Since 1980 this specific qi gong practice has been taught to millions of Chinese and has gained the support of the Chinese government. It is a very comprehensive system of practices very cleverly composed to deal with all of the major meridians and many of the significant acupoints to affect all parts of the body. Soaring Crane Qi Gong consists basically of two parts: The Five Routines, and Standing Meditation. The Five Routines practice consists of a series of relatively simple physical movements accompanied by mental visualizations (focus on the flow of energy, or qi). This practice, when done properly, requires 25 to 30 minutes to complete. It clears various meridians, opens up some specific points, and facilitates the cultivation, flow and balancing of qi in the body. Standing Meditation, usually taken up only after The Five Routines has been learned, done well and consistently for some time, consists of initially standing in a particular position, as loose and relaxed as possible, to allow for the flow of qi freely in the body. Often referred to as The Wise Doctor, this is a very powerful self-healing practice wherein the qi flows to those areas where there exists an imbalance or blockage of qi (resulting in disease). Through continued practice, the qi will persistently flow to problem areas until the imbalance or blockage has been repaired, thereby restoring health. This action of the qi may result in spontaneous movements of the body during the meditation. This meditation is generally practiced for about 30 minutes. 1. Sit comfortably, either on a straight-backed chair, or on the floor. The important thing is for your spine to be in an upright position, and your head arranged to allow the muscles of your neck and throat to feel relaxed. 2. Take a couple of deep, slow breaths, noticing how your abdomen rises with each inhalation, then relaxes back toward your spine with each exhalation. Let go of thoughts of past or future. 3. Rest the tip of your tongue gently on the roof of your mouth, somewhere behind, and close to, your upper front teeth. You’ll find the spot that feels perfect. 4. Smile gently, allowing your lips to feel full and smooth as they spread to the side and lift just slightly. This smile should be kind of like the Mona Lisa smile, or how we might smile – mostly to ourselves – if we had just gotten a joke that someone told us several days ago: nothing too extreme, just the kind of thing that relaxes our entire face and head, and makes us start to feel good inside. 5. Now bring your attention to the space between your eyebrows (the “Third Eye” center). As you rest your attention there, energy will begin to gather. Imagine that place to be like a pool of warm water, and as energy pools there, let your attention drift deeper into that pool – back and toward the center of your head. 6. Let your attention rest now right in the center of your brain – the space equidistant between the tips of your ears. This is a place referred to in Taoism as the Crystal Palace – home to the pineal, pituitary, thalamus and hypothalamus glands. Feel the energy gathering in this powerful place. 7. Allow this energy gathering in the Crystal Palace to flow forward into your eyes. Feel your eyes becoming “smiling eyes.” To enhance this, you can imagine that you’re gazing into the eyes of the person who you love the most, and they’re gazing back at you … infusing your eyes with this quality of loving-kindness and delight. 8. Now, direct the energy of your smiling eyes back and down into some place in your body that would like some of this healing energy. It might be a place where you’ve recently had an injury or illness. It might be a place that just feels a little numb or “sleepy,” or simply some place you’ve not recently explored. In any case, smile down into that place within your body, and feel that place opening to receive smile-energy. 9. Continue to smile into that place within your body, for as long as you’d like … letting it soak up smile-energy like a sponge soaks up water. 10. When this feels complete, direct your inner gaze, with its smile-energy, into your navel center, feeling warmth and brightness gathering now in your lower belly. 11. Release the tip of your tongue from the roof of your mouth, and release the smile (or keep it if it now feels natural). 1. As with all neidan practices, it’s important to find a balance between effort and relaxation. If you notice a build-up of tension, relax, take a couple of deep breaths, then return to the practice. If your mind wanders, simply notice this, and come back to the practice. 2. Remember to maintain the quality of a gentle, genuine smile – infused with the energy of loving-kindness and compassion – particularly when directing your “inner smile” into an injured place. If you notice frustration, anger, fear or judgment creeping in, take a couple of deep breaths, then connect again with loving-kindness and compassion – the energies that can heal us. 3. The Crystal Palace is known also – in Hindu yogic traditions – as the Cave of Brahma. Stand straight with feet apart, about shoulders’ width. Find a perfectly balanced posture. Breathe in slowly, gathering the qi in the general Dan Tian, an area three inches below the navel. On the exhale, send the qi to the Gate of Life, which is a point on the spine across from the navel, and from there out to the arms, hands, legs and feet. Practise for about thirty six breath at about six breaths per minute. You can also do this qigong while lying down and facing up. This exercise can be used for calming down. The origins of Hunyuan Qigong go back many thousands of years to an era when those who were wise were very closely connected with Nature and themselves. At that time, one was considered healthy when one lived in unity with the cosmos, and ill when one subdued one’s own emotions. Animals were not enemies, but rather friends. Nature was not exploited, but rather respected. People schooled themselves in modesty and contemplation and learned from one another. Such Daoistic hermits – who still live in seclusion today in the sacred mountains of China – were the early fathers and mothers of these transformation techniques, which are aimed at living as one with the vast, unfathomable energy of Nature. Following this path of perfecting existence involves the training of the adept’s individual perception. The ancient texts could help convey knowledge, but only to the extent that the trainee is prepared to explore Nature and the further development of the teachings prompted by his own creative motivation. An elderly master can die peacefully when he knows that a capable student will continue to research his life’s work. In this manner, the teachings of the wise elders have been handed down and refined for countless years and historical epochs to the extent that the masters found potential successors who not only emulated their teachings, but also fostered life in their commitment to creation, to Dao. The mother of all learning processes for a Daoist is Nature. The natural scientist recognizes Nature’s movement according to the law of polarity between the cosmic elemental forces of yin and yang. Thus, the spontaneous naturalness of life – everywhere and in every form – is the fundamental principle of a Daoist. If you have the inclination, observe Nature when you are relaxed. Have you ever seen a straight rainbow? Have you ever watched a tadpole swim in a straight line? Or perhaps you have seen a straight cloud, a straight tree, a straight snake, a straight ravine, straight water, a straight head or spine or tongue? Everything which truly exists naturally is created in the shape of a wave. Every form of natural movement is like a wave, for everything undulates when viewed physically. Even the movement at the very center of a laser beam is not completely straight. It cannot be, for the laser beam is also subject to the law of polarity and moves in waves, even if this cannot be seen with the naked eye. More about this in the next chapter. Qi can be best imagined by placing oneself in front of a tree for an hour, remaining motionless and letting whatever happens happen. For one should not attempt to comprehend Qi intellectually, but rather to experience it. Nevertheless, I shall attempt to find a few words to help clarify it. Qi is not anything “new”. Qi is a collective term for a communicative sphere in Nature which combines everything on the etheric level and makes an exchange possible at this structural level, just as in astrology, for example, where Mercury can effect the physical as well as mental state of a living being. Qi is a connective term which the breath of the cosmos can be explicated with. Qi, or simply vibrations, does not need to be manifested in a visible form. There are countless types of Qi, depending on the surroundings and context it effects. Thus, we have a certain quality of Qi for each organ in our bodies, since each organ has its own typical character and specific task and consequently, its own energy. Biophotons are an essential component of Qi in Nature because they are the smallest carriers of light, which transfer and exchange light from one form to another. An interesting excerpt from Marcus Schmieke’s observation of the human biophoton field illustrates the scientific view of the light of life: Biophotons are characterized by an extremely high degree of order and can be described as a type of biological laser light which is capable of interference and appears to be responsible for many effects which ordinary incoherent light could not achieve. Its high coherency lends the biophoton wave the capability of creating order and transmitting information while chaotic, incoherent light simply transmits energy. An indication of the coherent characteristics of biophotons is exhibited through experimentally proven knowledge that the so-called induced emission of biophontons diminishes hyperbolically, which illustrates an exclusive characteristic of coherent emission. There are clear experimental indications that biophotons have an important regulating function within the single cells, but also between the various cells. It is possible that the entire living organism is pervaded by a coherent biophoton field, which influences and regulates functions on various hierarchical levels of control and organization. Single cells seem to communicate with one another with the aid of the biophoton field by creating continuous waves. Accordingly, the biophoton field would be a rigidly structured field of information and regulation which combines the single parts of the organism in a holographic manner at the speed of light and coordinates their function with one another. There is a broad spectrum of various frequencies and polarization and therefore, a very high density of information. According to current developments in research, the biophoton wave is emitted from the chromatin of the cell nucleus. Calculations show that the helix form of the DNA molecule exhibits the ideal geometric form of a hollow resonator, which allows it to store light very effectively. Just as light is stored in the internal alchemy in the cinnabar field – the center of gravitation for the human being – it also occurs in the biochemical processes of the cells and in the macrocosmic processes of the galaxies or in spirals of climatic currents. The body’s light of life is contracted, channeled, sublimated and stored at the central continuum of gravity. The cell is called “small space” in Chinese and is a counterpart to space, which can refer to a room or any type of spatial classification. Be it the DNA double-helix spiral or the galactic spiral, a spiral encompasses the energy of creation, just as the embryo, the snail’s shell and the sleeping snake are also wound in the spiral of creation. The Daoist learns from the embryo of a human being or an animal, or from the cat or a sleeping snake, to store energy at the center of the coiling spiral in a restful or sleeping position, or to preserve the energy of life in this position. The material quantity of time and space which is physically or technically perceptible can be deemed unessential when considering the ingenuity of creative constructions. Cosmos is cosmos, whether it be micro-cosmos or macro-cosmos. Space is space, whether it be the synonym for a body cell or for intergalactic space. Energy is energy, whether it be a minute hormone or the sun’s power of radiation. When one observes the amazing spiral of a double helix through the most sensitive electron microscope, it is very well possible that in fact, the vastness of a galaxy can be perceived without one’s realizing it – for the rule of cosmic synchronicity prevails independent of space, and this is a fractal design. Look at the sky and you will see your inner space. Look into your inner space – and you will discover the sky. The teachings of Dao instruct us: the smallest overcomes the largest, the softest of the soft penetrates the hardest of the hard; the only tangible fact is the void, which subdues our over-stimulation and lies beyond what is happening. It is the void which allows for free perception without ideological taint. Modern quantum physics, in spite of its intellectual bearing, is gradually converging with the ancient knowledge of the magician: Light is “creative”, the cosmos in an unpredictably magical change. Researchers at American universities experimented with dividing and manipulating biophoton light rays by giving the photons alternative choices of direction, reflected above a silver-plated mirror. The result, which was amazing for the empirical researcher and logical for the natural scientist, was that it was not technically possible to predict or manipulate the path of the light ray because natural light has its own dynamics. Therefore, it is the creativity which is capable of collecting the light, the energy, or better said – the spontaneity. Biophotons are so spontaneous that astrophysicists assume that stars very far removed from the earth are seen as double, that the creativity of the universe is playing tricks on us and that because of the spontaneity of biophotons, time and space will be technically unpredictable factors as long as the “cold” and calculating applied science and the “warm” and creative magic of nature continue to be viewed separately. The following is a scientific remark from the renowned physicist, John Archibald Wheeler: Of all the characteristic features of creation, it is the elementary quantum phenomenon – the most sensational delayed-choice experiment (as briefly described – LT). It reverts back to the past of the apparent opposition of the normal ordering of time. The length of the distance when splitting a ray in a laboratory experiment can amount to 30 meters and last one tenth of a microsecond. The distance, however, could just as well have been millions of light years and lasted years. In this manner, the observing trick in the here-and-now, in congruence with its ultimate effect in one or another unpredictable direction, has an irretrievable consequence of which no one has the right to claim about the photon. For the photon already existed long before any life in the universe. Daoists – like the Druids, the ancient magicians of Nature – have always viewed the light of creation as something spontaneous and inspiring. A fundamental, but most often ignored characteristic of Qi holds true even today: creativity, the spiral. Spirals, many thousands of years old, are seen by the hundreds in cave drawings in the Cisalpine region, and the same patterns are found in Chartres, the spiral labyrinths – influenced by the Druids – in Brittany, Ireland and Scotland. Such types of “snake universes”, as can be seen in the magical diagrams of the Daoists or African shamans, signify the spiral dynamics, the scientifically described “creativity” of the cosmic energy. Therefore, the creative human being is capable of producing the most Qi. For this reason, the practice of an art such as music, poetry or painting was a fundamental component of the education of future priests of Nature both in the Daoistic as well as in the Druid teachings. Perfect tone, poetry, color, light and vibrations, find your elemental personal expression of creation and perfect your Being through perfecting the arts. Gravitons are also of utmost importance for those practicing Qigong. They are the smallest of particles loaded with energy which connect and attract us to the earth and the cosmos. How we channel the gravitonal energies will be comprehensively described in the chapter entitled “Alignment”. Whoever cannot believe in the all-pervading gravitational forces of the planets and consequently, astrology, need only recall tidal power stations, where the effect of ebb and flow is economically used for energy: turbines are powered by the gravitation of the moon, by the shifting level of water. Immense energies are at play there, but the potential is hardly used; the effect of trillions upon trillions of particles of gravity to which humans are not immune. Thus, we are permeated and surrounded by various forms of vibrations, whether we like it or not. Dealing with these vibrations – channeling, concentrating and bringing them into a natural balance – is what the term “gong” conveys: more simply described as “work” or more elegantly as “unfolding”. There are various examples of living beings in nature which can store Qi as actual “bioelectric” energy and ensure their survival with it. Such wonders of nature are considered role models by Daoists. The study of such wonders has made possible the development of the most diversified life practices. Perhaps the most impressive animal in this respect is the electric eel. This fish, at times up to two meters long, has organs in which it can store current in order to later paralyze its victims with jolts of up to 600 volts before eating them. Incidentally, long before the time of Christ the ancient Romans also knew about the healing effect of the meat of the electric eels and prescribed it to patients suffering from schizophrenia: thus, an ancient form of electrotherapy. The deer is another example of the art of concentrating energy. It can let its entire Qi flow over its head, where it concentrates Qi in its antlers just as if they were antennae. The deer is an effortless mountaineer due to the upward movement of its Qi; a mountaineer that moves itself to the top of the mountain, flowing in its life energy, without any perceptible effort. In replicating the upward movement of the deer’s Qi, the natural scientist learns how to collect and increase his own Qi above his head in order to manage distances at high altitudes and the gravitational forces of the earth. Another examples are animals such as the gazelle or even the cat, which can accomplish tremendous leaps by storing and “increasing” their Qi. Cats are masters of Qigong, for these predators are agile and flexible due to the storage, increase and sinking of Qi. Observe how a cat concentrates (Yi), collects its energy (Qi), and then leaps or attacks (fali). When you also consider the fact that cats always land on their feet due to their command of Qigong, you are left in awe. An incredible amount can be learned from the Qigong of animals. The art of Qigong – and naturally, the matial arts which are based on it – was developed in that way. Unfortunately, the deer’s antlers have been commercialized in China as tonic medicines for the above-mentioned reasons and in the West they are considered a coveted hunter’s trophy, symbolizing the hunter’s virility. In Europe the deer in fact symbolizes the God of the forest, the masculine aspect of nature. It should appear logical as to why this is so: male Qi typifies rising (phallus, antler – rising yang – fire), the female typifies sinking (menstruation – sinking yin – water). When the female aspect is united with the masculine, the great art of circulating energy – the way of Hunyuan Gongfu – is attained. The primary factor in the Daoist teachings of transformation is as follows: storing, directing, regulating and refining life energy. At the same time, a distinction is made between esoteric and exoteric methods which always pursue the aim, however, of increasing life energies and thereby outwitting physical and/or spiritual death. The oldest Daoistic practice of body transformation is called Yangsheng, which refers to the body and indicates the “food” of the body (bones). Sexual practices also play an important role in it. The physical body, which should lead to immortality, is also included in these methods. The body is not viewed as the Buddhist/Hindu illusion (Maya) but rather as the contrary: as the indispensable laboratory, in order to obtain the elixir of immortality. The religious Daoist who practices Yangsheng transcends the mind through the body in order to experience a psychosomatic enlightenment. In contrast to the Buddhism-influenced philosophical Daoism, where the immortal spirit is striven for, in the very earliest Daoism it is the body, spirit and soul which search – in harmony with the whole – for the freedom of earthly independence. In Buddhism one strives for a state of enlightenment, which is very abstract in the beginning and through deep meditation appears ever clearer. It is a future state of enlightenment (Nirvana) which the Buddhist searches for through the “purification” of his karma. In contrast, a Daoist himself strives to be spontaneous nature in the present moment and is therefore, with his endeavors, committed to the present. Immortality should, however, never be understood literally. Everything changes, and so there is no absolute immortality. Above the Daoist immortality, which begins consciously at a physical age of eighty years old, stands the zhenren – the true human being. The true human being is beyond the desires of the dissatisfied spirit, which is ultimately what the idea of immortality can be. Immortality begins when the adept masters the directing of natural powers. It ends when the adept has successfully moved beyond the phase of transforming and storing life energy. Thereafter, the master can concentrate on the phase of the true cosmic phenomenon, which the spirit still bound by material things could not perceive. Immortality in the Daoist sense does not mean, therefore, not an eternal physical life, but rather overcoming the normal span of bodily decline and birth as a conscious being of light. Yangshen means “food of the soul” and brings about a channeling and sublimation of the etheric vibrations in the body at the mind/soul level, forming the basis for all psychosomatic structures. Yangshen means the above-described term of transformation and freeing of the mind and soul and can, however, also mean the conscious training of the astral body in order to consciously leave the earthly temple at a given time, experiencing physical death as a liberating transition into the astral world. Yangshen focuses mainly on the mind, the soul, philosophy, asceticism and meditation, and in the earlier Daoist Yangsheng described above also on alchemy, magic and geomancy. The various directions have often overlapped in the course of history. It is said that both Yangsheng and Yangshen lead to the same result of perfection, although the original Daoism and more magically oriented Yangsheng is considered a faster way to “immortality” than the ascetic way of Yangshen, which is influenced by Chan Buddhism. The latter is, thus, the slower, but therefore certain way. The early Daoist Yangsheng unites many shamanic elements of former times. Three types of Qi are distinguished in the human being. The first is the prenatal Qi, which is produced from our genetic code (Jing) and gives our body its individual characteristics. In the second, we have the “acquired” Qi, the life energy, which we develop by eating and breathing. The third is the etheric Qi, which we produce through our thought and concentration potential. Qi is a term for the etheric life energy which contains life-giving light in various frequencies. The authentic teachings make it possible for the adept to synchronize the three circles of human vitality and thereby to harmonize them, thus enabling sheer vitality to unfold. Hunyuan is a Daoist term which is difficult to translate, but which can best be imagined as the nucleus of a human cell. The chromatin, the genetic code which moves chaotically, that is spontaneously, is like prenatal chaos – the “primary mass”, the cosmic primordial ocean. In this prenatal and chaotic state the chromosomes are invisible, intangible. When cells begin to divide themselves, two energetic poles are created, and the previous “chaotic” chromatin begins to spiral toward the poles until the poles have gathered enough energy to produce a single cell. Hunyuan depicts this moment where the primary mass, or the “absolute highest” (Taiji), creates the polarity and appears in various forms only to ultimately return once again to the whole. Hunyuan is the sacred process of the creation of a form which is created from the void. Thus, what is typical of Hunyuan is that these processes flow in an extraordinarily circular manner. More about this in the next chapter. If Qi were defined as the universal energy, there would preferably be two fundamental characteristics to emphasize: the tangible and the intangible energy. I previously mentioned coherent energy, which affects the targeted steering mechanisms, and the chaotic, incoherent form of living light, which merely transmits energy. For the sake of simplicity, I would like to return to the illustrative example of the body cell. I equate the chaotic and intangible “primary Qi ” in the cell nucleus – the chromatin – with the masculine aspect of the cosmos: the Dionysian, ecstatic, dancing and occasionally also aggressive universal energy which embodies rage, which powers the heartbeat, the dance of the stars and the hormones, the sensuous feast, the overflowing, ecstatic and unlimited principle of Cernunnos, the Lord of wild things in the Celtic tradition, or Pan, the Pan Gu, who bursts out of his eggshell in order to lend his driving energy flow to building of the world. This Dionysian, unrestrained Qi energy is without a doubt yang; illuminating, rising, overexerting, productive, unlimited, but over-extravagant in its boisterousness – fire. The necessary Apollonian complement to the universal Qi is the “soft” spiral female energy, which extinguishes the unrestrained male fire, the spiral of creation, the security of the ovum – the amniotic fluid, the constructive, creative moment, the very essential “sinking” of Qi in Qigong and Taijiquan, the comforting rain after the storm. The authentic Taijiquan unites these two principles most aptly; carried by the spiral movement of the waves in the water, the escalating whirlpool of the masculine surge is created, only to continue flowing in the perpetual stream. Authentic Yangsheng, the original Daoist teaching of ultimate health, goes back to the initiation of emperors. According to tradition, Emperor Qin (221-207 B.C. ), who united China, was led to the mountains of Kunlun in order to undergo the initiation rites in solitude, thus remaining true to the rule of the Emperor of the sky. Xi Wang Mu, Queen Mother of the West, one of the most important Daoistic deities, Mother of the stars and Western paradise, is the keeper of the divine peach which leads to immortality. It was the “Goddess”, the female aspect of Nature, which signified initiations in the cosmic teachings, also during the time of the sons of the sky – the emperors. The lesson of the peach is, like all myths, to be understood symbolically and depicts the initiation in the pure fruit. The divine fruit ripened into the elixir of immortality every six thousand years. The Daoist priests and priestesses were seen as the keepers of the sacred knowledge of the Emperor of the sky at that time. The priesthood was the earthly family of immortals on earth – the Emperor of the sky – and therefore, also the educators and mentors of the offspring of the sky – the emperors. The initiation and the magic of these strictly secret rites conceal the essence of the three circles in their core. The notable ancient Chinese medicine, which was reserved only for the priesthood and the imperial family, is based on the three circles. These three circles are connected, on the one hand, with the lunar cycles (namely with the waxing, full and new moon as well as the waning cycle), and on the other hand with the three centers of energy (the lower, animal, earthly cycle which creates sexual energy; the middle cycle which directs the actual human level; and the upper cycle which directs the mental level). The meridians of the body are secondary and subordinate to these three cycles. We work mainly with the lower cycle in this book – the gravitonal center of the being – although the other two are referred to again and again. The exercise for “opening the earthly gate”, described in following chapters, corresponds to the lower cycle, the “expanding of the middle cycle” to the middle cycle at the level of the solar plexus, and the exercise called “the cycle of the eye” to the upper cycle. Ultimately, the essence of this emperor’s schooling is to bring the three cycles into synchronic vibration. Only when these three spheres of human life are balanced and connected, can true and complete health be spoken of, and only then is one actually in the position to enter into the fourth cycle, the fourth dimension. You may gain insight into this mystery in my book entitled “Die Kreise des Goldenen Drachen”. The teachings of Hunyuan Gongfu go back to this time of unspoiled Daoism. Authentic exercises for health and the training of the martial arts, which are based on the observations of animals and natural phenomena, go back in history to the very first origins of man. Yangsheng – the teaching of transformation – and also Taijiquan, Xingyiquan and Baguazhang, in short the internal martial arts, are the conversion into practice of these mysteries, which are only seldom found in their pure form in today’s world. It is interesting to note here that the continuing history of Daoism – for example, in the monasteries in the Wudang mountains, the sacred mountains of the Daoistic martial arts and magic – arose from the rebellion of the peasants who no longer wanted to live under the oppression of the imperial family and fled to the mountains. Daoist hermits and – according to the legend – the masters rising to the seventy-second rank took them in. The result was that one of the most important spiritual centers of China was created on the mountain crests. The peasants were assimilated through the energy of the sacred mountains and later formed the priesthood which has lasted until today. The many thousands of years of China’s history gave this land the widely diverse, and at times (for the Western mind) controversial periods of culture and empirical science. Today, the exponents of Qigong, also well known to the Western world, are the exercises of the legendary doctor and master Hua Tuo, who lived toward the end of the Han dynasty from 141-203. Hua Tuo is considered one of the fathers of Chinese medicine; it is said that he lived on the Huashan, at times as a hermit, where he tested the effects of medicinal plants. The “exercises of the five animals”, an actual original form of Qigong, which is later described in the chapter entitled “The Eight Wonders of Dao”, leads back to Hua Tuo. But also here the historiography is insufficient, for it is certainly an unlikely assumption that Hua Tuo learned medicinal properties of plants as well as Daoist Qigong from the priests living there, for they had already practiced such systems since ancient times. Another well-known Master of Qigong recorded in history was Quan Zhongli (608-905). He is considered to have been a great Daoist magician and is reported to have created the “eightfold brocade exercises” – “Baduanjing” in Chinese – which are widely practiced today around the world due to their simple movements. They are, however, most often only very superficially exercised because today’s “adepts” lack the magical understanding of Nature. At this time of the Tang dynasty, exceedingly diverse methods of the martial arts and body transformation were created. Daoists did not usually subordinate themselves to an earthly authority, but rather were bound only to Dao. If an emperor were of pure heart, they supported him, if not, they attempted to bring him to the right path, for he was considered the son of the sky. But ultimately it was all the same to the Daoists that they were left in peace to explore the cosmos and immerse themselves in meditation. In the eyes of many Chinese, the Daoists are only good-for-nothings who are a burden to society, for they do not earn money and, except for quite a few gifted artists among the priests and priestesses, rely on support. On the other hand, since the founding of Zhenyipai, which allows the combination of a secular and spiritual life, there have been tremendously wealthy business people and Daoist Free Masons who have influenced the business world in all of Asia and more recently the entire world. These circles support the monasteries and the thousands of priests and priestesses who live in seclusion. Many hermits do not, however, wish for support in the form of safe ladders that lead up the vertical rock faces in the mountains to the caves and simple dwellings of the masters. They also do not want the institutionalized delivery of food and mail, which limits their spiritual and ritual freedom and leads to a comfortable structure of dependence. The simplified paths also lead the novice pilgrims to the masters. Many priests saw themselves forced to recede to the highest mountaintops in the most remote and inhospitable regions due to the global complexity of materialism. Hunyuan Gongfu stems directly from the roots of Daoism, and has maintained an uninterrupted lineage from master to student up to today. I have taken on the responsibility of carrying on the lineage properly from Feng Zhiqiang, who still bears the magic of ancient China. The origins of Hunyuan Qigong stem mainly from the “Art of form from the power of the mind from the six treasures of unifying the heart and concentration (Liuhe Xinxingyiquan)”, the origin of the later Xingyiquan from the alchemic internal schools of religious Daoism, the Daoyin; the evolving of the “exercises of the five animals”; the breathing and meditation techniques of “Tuna Fa”; and the ” The art of Taijiquan” from the authentic Taijiquan. Through my own personal explorations in all modesty, there are additional alchemic elements which have sprung from the origins of the Taijiquan, the Wudang pai, the school of the polar star as well as the Huashanpai, the celestial axis, the secrets of the sacred Chinese mountains. In their original form, which hardly exists today, these ancient Daoist life practices include not only medicine and martial arts, but also the systems of transformation, which cover all areas of life – the arts of changing resonance, vibrations. Strictly speaking, the term Qigong is only partially true, for one could just as well mention Neigong, Gongfu, Jingong or Shengong. You will learn the reason for this in the course of the book. In summary, one can label all these levels as internal mastery – Neigongfu. Carrying over the authentic systems to today is without doubt a wonder when you think what the world has experienced recently. Vegetarians, for example, were considered counter-revolutionaries and thus, interrogated and tortured during the cultural revolution in China. Healers and masters of the internal martial arts as well as priests and monks, when recognized as such, were banished in re-education and disciplinary camps. My elderly teachers experienced this no differently. Under the Nationalists before them, it must have also been dire. The key figure of today’s Hunyuan Qigong is the Grand Master Feng Zhiqiang from Peking. He entrusted to me the continuation of his ancient, almost extinct traditions into the future. His most important teachers were Hu Yaozhen, gifted healer (doctor), and Master of Liuhe Xingyiquan (1890-1973) and his friend Chen Fake, the legendary Master of Taijiquan (1886-1957). My spiritual father, Grand Master Feng Zhiqiang, is in his seventies and in the best of health (he is still without gray hair), and one of the most well-known and important masters of the martial arts and Qigong in the world today. He is, for example, the official head of the Chen-style Taijiquan, the authentic shadow boxing. Feng Zhiqiang is one of the few people in this world who, as a bearer of culture, carries the legacy of the wisdom of thousands of years of history. A master of an extinct art – which I, as his successor, will carry on in the uninterrupted line of transmission in remembrance of the countless ancestors and in honor of and gratitude to all masters. There are probably a few thousand styles of qigong in China. Among these, Zhineng Qigong stands out as one of the most effective in improving a person’s health and nourishing his body with vital universal energy. Translated literally, Zhineng Qigong means “Cultivating Intelligent Energy”. Zhineng Qigong was created by Pang Ming , a gifted Qigong teacher with training in Chinese and Western medicine and who had received tutelage from 19 Grandmasters in qigong and martial arts since his early childhood. With the creation of Zhineng Qigong, he has combined the ancient Chinese internal cultivation of Qigong as a healing art with the modern science knowledge of the body and mind. Qigong practice which has been kept secret in China for over 5000 years within families and esoteric schools, has now been made available to the general public and benefiting millions of people around the world. Dr. Pang also founded the largest medicine-less hospital in China , where Zhineng Qigong was used to study mind-body science and its applications to self-healing. He has set up training centers in China that have trained thousands of qigong teachers, most of whom have chosen to dedicate their lives to share and teach qigong to the public. Qigong is different from other exercises such as sports. In qigong you direct your mind inwards while in most exercises the mind is directed externally upon the competitors instead of the activity within the body. Qigong emphasizes cultivating virtue, refining consciousness, regulating breath, and moving the body, while sports are mainly focused on bodily movement. In moving the body, qigong uses the mind to direct chi, chi to direct the body, the movement of the body to serve the spirit, mind and chi, and experience mystery of the body in total relaxation. In sports, one is trained to focus on physical form while the mind is not directed internally, instead towards the movement of the body or tools. The mind becomes the servant to facilitate and synchronize a sequence of movements, moving muscles, tendons, etc. In terms of regeneration within the body, sports promote the consumption of energy to accelerate this process through triggering the movement of muscles and transforming chemical energy into mechanical energy. Therefore, it requires extra nutrition and more rest to recover the energy. In other words, sports and exercise is designed to amplify the quantity of life energy that comes into and flows out of the body. In contrast, qigong training reduces the consumption of energy, slowing down the process of regeneration. It regulates the order of internal life activity and reorganizes the biological structure, therefore increasing life vitality. Zhineng Qigong is an open system. It emphasizes the connection between the individual and the environment, between the human internal chi and universal external chi. The practice applies the universal chi to strengthen the person’s Jing, Chi, and Shen. It also encourages the practice of Qigong through daily living. And it stresses the importance of interaction between human and his environment. Both systems and the thousands of schools of teaching share the same goal of enhancing the vitality of life, exploring potential intelligence, and improving the quality of life. As a beginner, it is important to choose a suitable method according to one’s own preference. Eventually, through practice of one particular form and based on a strong foundation, one will be prepared to understand and incorporate different teachings in order to progress. Lift Chi Up and Pour Chi Down (Peng Qi Guan Ding Fa) – This is the basic form of the Level 1 practice and consists of a series of gentle body movements, synchronized with meditative visualization to open any blockages inside and promote the exchange of Chi between the body and the Universe. The three sequences in this Form are designed to gather Chi into the three Dantians. Three Centers Merge Standing Method (San Xin Ping Zhan Zhuang) – This method utilizes a proper alignment of body and centering of mind into a powerful posture designed to root the body into the earth, connect the three main meridians and collect Chi at the Dantian. The method can quickly attain strength and balance of energy. Stretching Chi (Chen Qi) – This is an effective method to stimulate and mobilize internal physical chi and unify chi within the entire body as a whole. Wall Squatting (Dun Qiang) – This involves a gentle up-down movement of the body while facing a wall. The practice corrects the spinal structure and relaxes the whole body. It is a very effective stress reduction method and also gives a strong feeling of Chi. With daily practice, it can lead to a high level of Qigong cultivation. Body & Mind Method (Xing Shen Zhuang) – This is the basic form of the Level 2 practice, comprising 10 steps. It works with the internal chi within the body, to open joints and meridians and accumulate Hun Yuan (universal) chi throughout the whole body, from skin to bone. It is a discipline designed to unite the mind with the body and enhance the mind’s ability to command the body, thereby integrating mind and body. Five Elements Unified Method (Wu Yuan Zhuang) – Using sound, movement, and breathing techniques, the method is to activate and balance the internal Chi of five organs thereby unifying the essential Chi of the internal organs into the middle Dantian. It helps to achieve physical cleansing as well as emotional balance. The earliest exclusive texts that deal with the meditative practices and the gymnastic exercises are the recent archaeological text discoveries. After the Han dynasty, the most obtainable texts have been transmitted in the Taoist Cannon, or Daozang 道藏, which was edited in the Ming dynasty (1368-1644). Taiqing zhenren looming jue 太清真人絡命訣, from the 3rd or 4th century. Xiandao jing 顯道經. 3rd century. Taiqing daoyin yangsheng jing 太清導引養生經 from the 4th century. Taishang huangting waijing yujing 太上黃庭外景玉經. Before AD 255. Yangxing Yanming lu 養性延命錄. Attributed to Tao Hingjing 陶弘景 (456-536). Tianyin zi 天隱子 6 fols. By Sima Chengzhen 司馬承禎 or Bai Yunzi 白雲子 (647-735). Taixi jingzhu 胎息經註. Commentary by Huanzhen Xiansheng 幻真先生 (late ninth century?). Huanzhen Xianshen Funeiyuanqi jue 幻真先生服內元氣訣. Taishang yangsheng taixi qijing 太上養生胎息氣經. Cunshen lianqi ming 存神練氣銘 Attributed to Sun Simo 孫思邈. Huangting neijing wuzang liufu buxie tu 黃庭內經五臟六腑補瀉圖. By Hu Yin 胡愔, 848? Siqi shesheng tu 四氣攝生圖. Late Tang. Huangting dunjia yuanshen jing 黃庭遁甲緣身經. Tang dynasty. Taishang chusanshi jiuchong baosheng jing 太上除三尸九虫保生經. Late Tang Dynasty? Xiuzhen liyan chaotu 修真歷驗鈔圖. Tang dynasty. Wuzhen pian 悟真篇, by the “Southern Patriarch” Zhang Boduan 張伯端 (984-1028); commentaries by Ye Shibiao 葉士表 (dated 1161), and Yuan Gongfu 遠公輔 (dated 1202). Yuqing jinsi qinghua biwen jinbao neilian danjue 玉清金笥青華祕文金寶內練丹訣, by Zhang Boduan. Yunji qiqian 雲笈七籤. Complied by Zhang Junfang 張君房 (fl. 1008-1025). Zhenyi jingdan jue 真一金丹訣. By Wang Chang 王常, Song (960-1279). Cuigong ruyaojing zhujie 崔公入藥鏡注解. Attributed to cui Xifan 崔希範, commentaries by Wang Jie 王玠, or Hunranzi 混然子, ca. 1331. Zhenxian bizhuan huohou fa 真仙祕傳火候法. Late Song (960-1279). Bichuan Zhengyang zhenren lingbao bifa 祕傳正陽真人靈寶畢法. Attributed to Zhongli quan 鐘離權, or Yunfang 雲房, Zhengyang zhenren 正陽真人; transmitted by Lu Yan 呂嵒, or Lu Dongbin 呂洞賓, Chunyang zhenren 純陽真人. Dadan zhizhi 大丹直指. Attributed to the Quanzhen Patriarch Qiu Chuji 丘處機 (1148-1229), or Qiu Changchun 丘長春. Zazhu jiejing 雜著捷徑. Yuan dynasty. Chen Xubo guizhong zhinan 陳虛白規中指南 . By Chen Chongsu 陳沖素 (ca. 13th century), or Xubozi 虛白子. Daoyan qianjin shuo 道言淺近說 By Zhang Sanfeng 張三豐 (ca. 13th century). From the Ming dynasty to the 1911 revolution, many meditative and gymnastic practices have flourished and been widely developed from the Song synthesis of Confucianism, Buddhism, and Taoism, however, their original foundations have remained largely untouched. The Ming and Qing meditative and gymnastic texts are essentially commentaries and reinterpretations of the Han, Tang, Song, and Yuan classics. Chen Xiyi ershisiqi daoyin zuogong tushi 陳希夷二十四氣導引圖勢. Tianxian zhengli zhilun 天仙正理直論, Wu Shouyang 伍守陽, or Chongxuzi 沖虛子 was born in 1574. He found wuliu pai 伍柳派, the Wuliu School, one of the most influential inner alchemic school in Ming and Qing times. Shenshi bafa, 神室八法 Liu Yiming 劉一明 (1734-1821), or Wu Yuanzi, 悟元子. He is also known as the transmitter and commentater of Zhang Sanfeng’s Inner Alchemic work Wugen shu 無根樹, or Rootless Tree. Tianxian jindan xinfa 天仙金丹心法, written by Liu Shouyuan 柳守元 between 1813-1815. The methods in this text belong to Quanzhen Northern School. What makes this text interesting is that the text was written in codes—the order of the words was arranged in a completely nonsense way. Accordingly, no one could have read the text until Zhao Songfei 趙松飛 decoded the text in 1988. After the fall of the Qing dynasty, there has been a hope for China to create a new synthesis of government that would transform China into a modern nation-state. This hope largely depends on the ideology of moving China away from its “feudal” past, and releasing China from its “economic backwards” into a new and advanced level of development without the ills of the capitalist system. Under such a social and political background, the meditative and gymnastic practices along with other traditional cultural practices are inevitably considered as superstitions and anti-science. Regardless of the different ideologies of the Chinese Nationalism (1911-1949) and Communism (1949-present), there has been a great attempt to divest religious and cultural contexts so that the meditative and gymnastic practices can be scientifically proved, accessible to everyone, and undertaken collectively. Jingzuofa jingyi 靜坐法精義, the manual was written in 1920 by the Buddhist scholar Ding Fubao 丁福保 (1874-1952). In the preface, Ding indicates the importance of oral transmission. He claims that the accumulated and secret transmissions in his manual were edited from innumerable meditation books. (Wang, 137) The methods and techniques described in the above three texts are all based on the theory and methods of Tiantai Zhiyi’s 天臺智顗 Treatise on Calming and Discernment 止觀法, in which case, expression of “four kinds of samãdhi” is described as four ways of posture and physical activity, they could conceivably incorporate any form of spiritual discipline or techniques of mental discernment. The descriptions in the present works are lucid, direct, and vernacular. Yijin xisui jing 易筋洗髓經, was attributed to the first Chan patriarch Bodhidharma, written in 1624 by Taoist Zinin Daoren 紫凝道人, based on the Han gymnastics and the Yuan Eight Length of Brocade, commentated by Zhou Renfeng 周稔豐 in 1989. DZ, Taoist Canon, Daozang 道藏. 1988. Beijing: Wenwu Chubanshe. Fang, Chunyang 方春陽 ed. 1988. The Great Anthology of Chinese Qi Gong Classics, Zhongguo Qigong Dacheng 中國氣功大成. Jiling: Jiling Science and Technology Press. Li Ling 李零. 2001. A Study on Chinese Occult Arts, Zhongguo fangshu kao 中國方術考. Beijing: Eastern Press. Li Shaopo 李少波. 1999. The Way of Circulating True Qi, Zhenqi yunxing fa 真氣運行法. Lanzhou: Gansu People’s Press. Tao Bingfu 陶秉福. 1987. An Outstanding Collection of Qi Gong Treatment, Qigong liaofa jijin 氣功療法集錦. Beijing: People’s Health Press. Wang, Maohe 汪茂和. 1998. Commentaries on Selected Historical Treaties on Tending Life and the Original Nature, Lidaiyangsheng yangxing lunxuanyi 歷代養生養性論選譯. Beijing: Chinese Youth Press. Wang, Xiping 王西平. 1993. The Collected Essential Secrets of Sitting Meditation, Jingzuo fajue huiyao 靜坐法訣匯要. Huhehaote: Neimenggu People’s Press. Zhao, Songfei 趙松飛. 1997. The Heart Transmission of Heavenly Immortal’s Gold Elixir, and the Decoded Secret Qi Gong Texts, Tianxian jindan xinfa, fuqigong miwen poyi 天仙金丹心法附氣功秘文破譯. Beijing: Zhonghua shuju. Zhou, Renfeng 周稔豐. 1989. The Book for the Revitalization of Tendons and the Purification of Marrows, Yijin xisui jing 易筋洗髓經. Tianjing: Tianjing University Press. The purpose of this meditation exercise is to clear energy blockages along the front and back channels; to physically clear the roots of sickness; and to open the energy centers along these channels. The most important energy channels are the back and front channels in the torso. When energy starts at one point on these channels, visits all the parts of the system, and comes back to the starting point, we have what is called a “Small Universe.” By focusing on moving the energy along these two main channels in the Small Universe, you have a profoundly positive effect on the Big Universe of the whole body. The back channel starts at the lower Dantian area, which is behind the navel. It goes down to the bottom of the torso, travels up along the spine to the top of the head and comes down from the middle of the forehead stopping at the roof of the mouth. It governs all the Yang or male energy channels in the body. The front channel also starts from the lower Dantian area, goes down to the bottom of the torso, travels up the body, passing through the heart and throat, and stopping under the tongue. It governs all the Yin or female energy channels in the body. These two channels automatically connect together four hours a day: at midday between 11:00 a.m. and 1:00 p.m. and at midnight between 11:00 p.m. to 1:00 a.m. Qigong practitioners like to meditate at noon and midnight because it takes less energy and generates greater benefits. Nearly all the important energy centers are arranged along the back and front channels. As a result, a blockage in the heart energy center could cause not only heart problems but problems in the lungs, breasts, chest or even mental problems. A blockage in the tailbone could cause reproductive organ problems, low sexual energy, or even headaches. A blockage in the cervical bone #7 of the spinal cord could cause headaches, fever, diabetes or even lung or heart problems. The Small Universe is the easiest meditation technique to open these two main channels. I have created an audiotape and CD with beautiful background music and guide you through each movement in this meditation. Especially if you are a beginner, it is very difficult to do this meditation on your own. Born A Healer: I was born a healer. You were born a healer, too!